You need to get busy planting now! There are two key things to consider when choosing a site for your bulbs. The first is sunlight. Most bulbs need several hours of sunshine to bloom well next spring and to store up the energy they need to flower the following year. The second thing to consider when choosing your planting site is drainage. All bulbs need good drainage. Bulbs that are planted in areas that tend to remain wet will in most likely rot leaving you extremely disappointed come spring. A heavy clay soil can be improved by digging in an organic matter like composted manure or compost. There are basically two options for planting bulbs. Depending on how many bulbs you are planting (hopefully hundreds! ), you can either plant a large area at one time or plant bulbs individually. If you have enough bulbs to cover a fairly large area, it may be smart to excavate the area to be planted and loosen the soil to the recommended depth (usually 6-8”) for the type of bulbs you have. Set the bulbs in the bed with the point facing up, grouped by color or randomly placed and gently replace the soil. If the soil is very dry as it has been here in the Lakes Region this fall, water it thoroughly. The other option is to plant each bulb individually by digging each hole with a trowel or bulb planter. Again, loosen the soil to the correct depth, put one bulb in each hole, cover gently and water. This is an option – if we could twist your arm, we would make you plant bulbs in groups though. The impact is much better than a bulb here and a bulb there! Most bulbs come with instructions for a best-case scenario planting schedule. We usually miss that and go ahead and plant them anyway! You should, too! The ideal time for planting most bulbs is at least six weeks before a solid, ground-freezing frost. 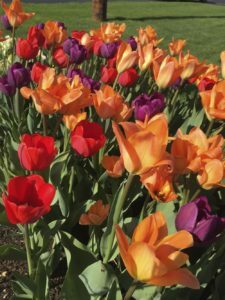 Planting too early may leave bulbs vulnerable to rot or fungus and planting too late may not give them enough time to root and establish themselves for blooming in the spring. A lot of what you read about ideal planting time for zones 4 and 5 will tell you late September through early October is the best time. IGNORE this rule most years! Successful spring flower displays require bulbs to be planted once we have had at least 2 weeks of 40-45 degree nights. At that point, soil temperature here in the Lakes Region should be just perfect for planting bulbs. This part is easy! Water thoroughly after planting if the soil is dry. After that, forget about it, at least here in New Hampshire. Supplemental watering in the spring, especially after bulbs bloom, may cause them to rot. 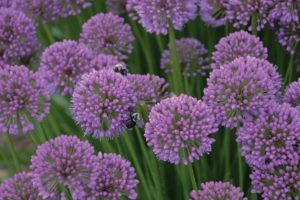 Bulbs that you purchase to plant this fall already have next year’s flowers set inside them, so there is no need to fertilize at planting time. 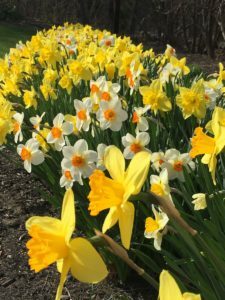 You can generally do without fertilizer entirely as most bulbs are not heavy feeders, but if you amend your soil with an organic supplement like compost or manure in the spring, it certainly won’t hurt the bulbs. This bit of info may help you decide where you plant your bulbs in the first place. You can deadhead the flower of the tulip once it fades, but bulbs get the energy they need to bloom the following year from their foliage. For this reason you need to let the foliage die back naturally. This can take quite a while and often looks unsightly as you plan your late spring garden. Short cuts like braiding, tying up or burying foliage before it has died back, impedes the natural process the bulb needs to go through in order to bloom again the following year. 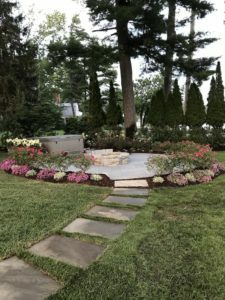 For this reason, a lot of gardeners simply cut back foliage, dig out bulbs and start over again with new ones in the fall, or dedicate an area exclusively to bulbs. That way the bulbs don’t interfere with annual and perennial plantings. Unfortunately, your bulb display could fall victim to hungry squirrels or deer before they ever get a chance to bloom. Tulips apparently make a nice meal. One way to avoid losing your spring display is to lay chicken wire across the planting zone. Light and water can get through and so can the flower when it grows in the spring. There are a few bulbs that are truly deer and rodent proof. They are members of the Amaryllis family, which includes daffodils. They have a toxic alkaloid called lycorine that mammals can detect and won’t eat. Other bulbs such as Allium and Fritillaria are also known to be unpleasant to smell and eat. Plant some of these in and around the more appetizing varieties and you may just be OK! 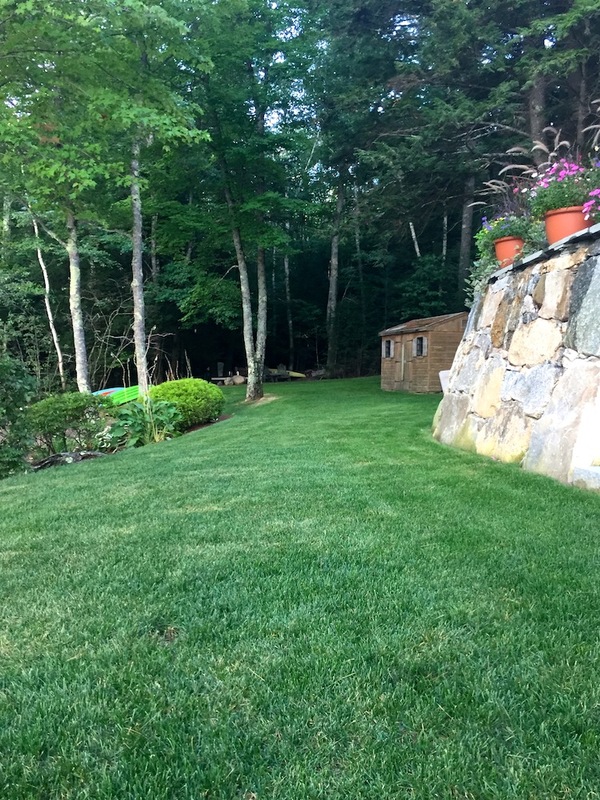 Why Compost Your Lakes Region Lawn? The soil in your lawn contains living microorganisms including bacteria, algae, fungi, and protozoa. Without getting too technical lets just say that a healthy soil has lots of biological life and these organisms need organic matter (compost) to survive and thrive. This living-soil-life helps with soil health, decomposition of organic matter, replenishing of nutrients, humus formation, promotion of root growth, nutrient uptake, and herbicide and pesticide breakdown. Your earthworm population will increase as your organic matter increases, which will help increase nutrient levels, water levels and penetration and aeration as they move through the soil. Compost adds organic matter into your garden soil that increases the population of soil microorganisms, which in turn help control plant diseases. The addition of compost may also provide greater drought resistance and more efficient water utilization. Therefore, the frequency and intensity of irrigation may be reduced. After aerating (or even if you don’t aerate), topdress the turf surface with a 1/4″ layer of compost. The compost will settle into the soil, adding nutrition and structure that will serve the grass roots well the following season. 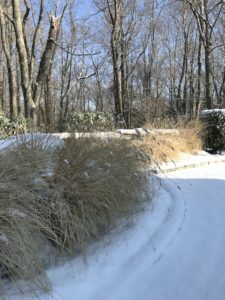 Then spreading an inch of compost on the newly aerated lawn will provide a perfect fall feeding, dramatically improve the organic matter content of your soil, and provide a perfect seed bed for the final step of filling in bare spots with fresh seed. 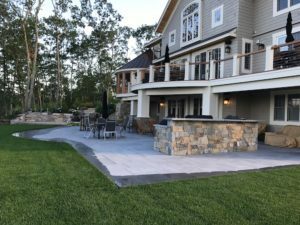 And it’s easy — just have a big load of compost delivered, shovel it into wheelbarrow loads, dump them out on the lawn and then use a rake to spread it all around as evenly as possible… or call Miracle Farms if you need a hand with fall lawn services. Next, spread new seed to fill in bare spots. Just sow the seed by hand or in a spreader and gently rake it into that wonderful compost. Don’t put down straw or other nonsense — it limits the germination and looks awful going forward. Gently water the lawn for half an hour morning and night until the seed sprouts, which will be quick in this perfect weather. After it sprouts, cut back to morning only, and if our weather pattern shifts and we begin to get more reliable rain, you won’t need to water at all. Will compost eliminate the need for commercial fertilizers? Not necessarily which is not a straight answer, but there really isn’t one. 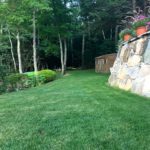 Depending on what nutrients your soil is lacking (or has an abundance of) certain organic fertilizer will be necessary. In addition to providing nutrients (both micro and macro), compost helps make fertilizer more effective in the soil.